LOCATION: Villa ai Tigli B&B in Venice, Italy. We stayed at this great bed & breakfast on the mainland of Venice during our trip in July, 2009 for la Biennale art festival. There was a skylight in our 3rd floor room and at 11 am our first morning there was a perfect shadow cast from the handle of the window. 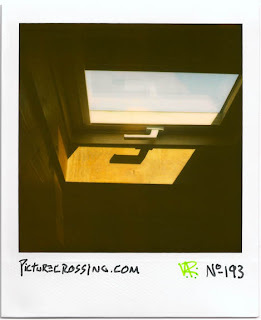 This image gives me the impression of a hatchway directly to the sky, which I suppose is actually the definition of what a skylight is. But this just seems a bit more dramatic somehow. We were exhausted from our 21 hour drive from Belgium. Traffic was backed up in Switzerland as a long tunnel was being repaired and only allowing one way traffic to take turns. So after one CP shot at Redentore the night before - this was my 2nd shot on the Venice trip. CROSSED WITH: PX No. 188 of a deStijl relationship showing a storefront. 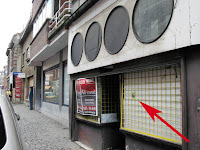 LEFT: On 7/24/09 at the vacant shop on Rue de Bertaimont, Mons, Belgium.